Learn about what Royal Waste is doing to help your community. With frequently changing rules and regulations for New York City disposal laws, it is our mission at Royal Waste to keep consumers informed and ready to for changes. The New York City Department of Sanitation recently enacted new organic disposal rules for commercial and residential establishments. The New York City Organics Collection Program allows the Department of Sanitation and waste management companies to collect compostable organics. Participation for most constituents is voluntary, though there are some requirements for commercial establishments. 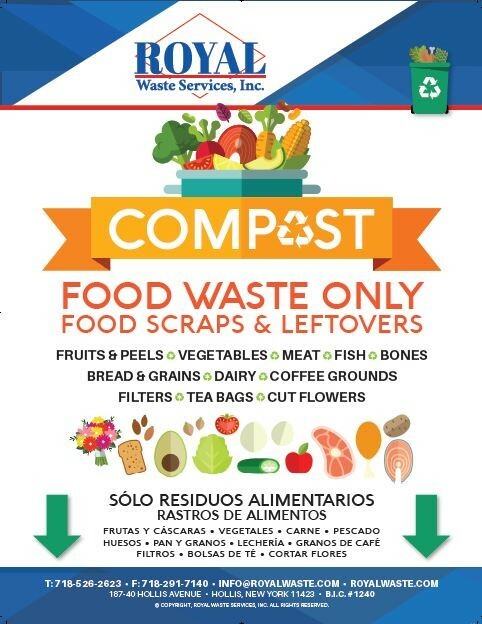 With the new NYC funded program, volunteer participants will receive starter-kits complete with countertop compost disposal containers, an informational document breaking down what can and cannot be placed in the organics disposal, and other literature explaining how to properly participate in the program. Participants in the program may put their disposals curbside just as they do other waste and garbage. Royal Waste Services is one of New York City’s premier waste pickup services that collect organic waste directly from the commercial location in order to comply with new laws and follow New York City regulations. New York City collects over 3 million tons of trash and recycling each year from residents alone, after adding commercial, construction, and demolition waste, the total comes to 14 tons annually. * Residential recycling participation clocks in at just 15%, even though more than 30% is curbside recyclable. Another 30% is considered organic waste and can be composted, but isn’t! What is considered organic waste in New York City? All food scraps, from pizza crust to carrot shavings. Plant trimmings, yard waste, and other organic matter is considered organic waste. Food soiled waste such as used tea bags or coffee filters, as well as certified compostable cutlery, plates, and napkins are also considered organic waste. 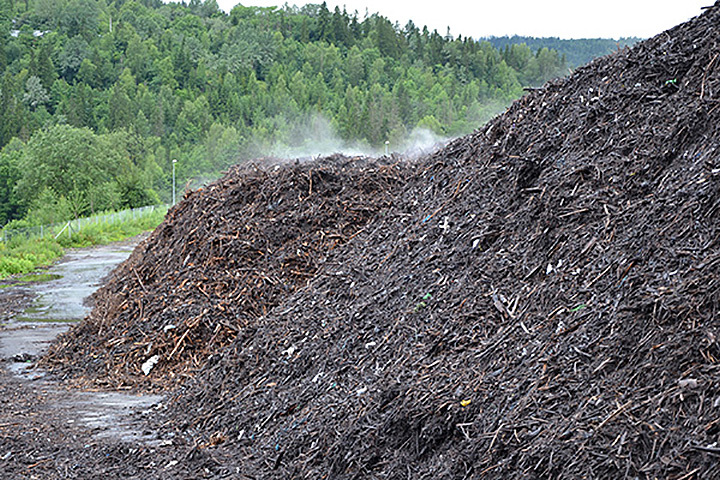 This organic waste can all be composted and converted into soil and renewable energy. Royal Waste Services offers curbside pickup for any kind of waste throughout New York City including Queens, Manhattan, Brooklyn, Bronx, Westchester, Nassau, Suffolk and Staten Island. Royal Waste’s strong commitment to the environment and partnerships with businesses across New York City creating simple and easy to follow waste management plans. By separating organic waste from our recyclables and other discards, New Yorkers cut the amount of trash that ends up in landfills. When organic waste is diverted from landfills there is a huge cut in greenhouse gas emissions, thus decreasing consumer’s own ecological footprint. With the implementation of organic composting throughout New York City, new opportunities for residents and businesses to improve their environmental practices and lessen their environmental impact. The simple truth about properly disposing organic waste is just that; simple. There are numerous benefits of separating organic and raw materials from your everyday trash bin, and when executed perfectly, can make a strong positive impact on the environment. Fact: Vermin can be easily deterred by using the proper disposal containers for curbside pickup. By using industrial-grade air-locked bin, you will attract no unwanted visitors to your property. Fact: With the increasing popularity of at-home composting habits, more and more attractive, low-key options have become available. An understated ceramic countertop crock is a convenient way to collect scraps. Just line the container with a biodegradable liner and you have an easily removable bag of scraps to toss directly into your organic waste bin come trash day. Fact: By introducing a new method of disposal in our New York City home or office, New Yorkers can easily create the new normal routine, teach children and coworkers alike the importance and ease of separating our waste. With that stylish countertop crock, everyone in your home can be composting in no time. Contact Royal Waste today to discuss how to optimize your businesses sanitation and waste programs! 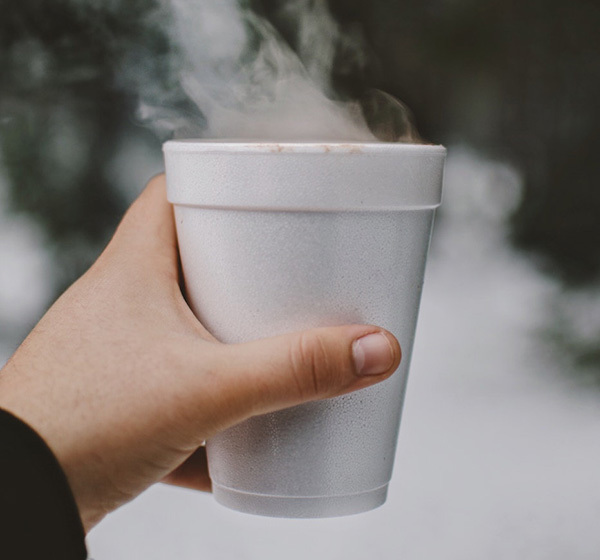 Great news New Yorkers, our city is finally joining a growing list of municipalities across the country to ban styrofoam, a.k.a. polystyrene. This incredibly complex product is nearly impossible to recycle. It virtually never breaks down, and ends up in landfills, as litter on our streets, oceans and waterways, and is harmful to wildlife and public health. 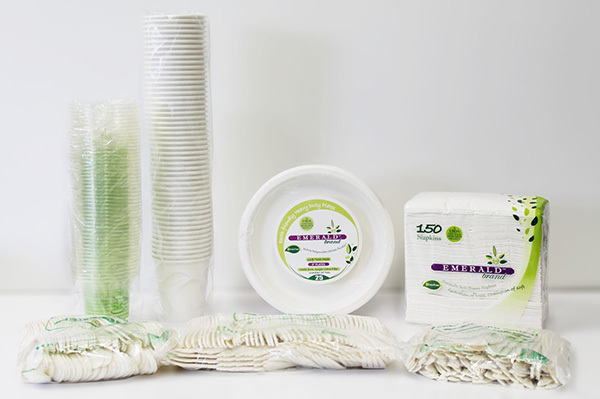 New York City’s Styrofoam ban reinforces their commitment to reducing waste and to our environment! An estimated 25 billion styrofoam cups are used and disposed of by Americans each year. * Now, with the help of this foam ban in New York city, that number will drop drastically in the next few years. Let’s use this new opportunity to educate our peers about the importance of continuing to develop new legislation in favor of our environment. Polystyrene easily breaks down into tiny particles, but the indestructible foam remains in the environment for into the hundreds of years, and eventually making its way into waterways used by humans and wildlife tainting our drinking water. New York City’s new ban on styrofoam is a win for the city and planet. 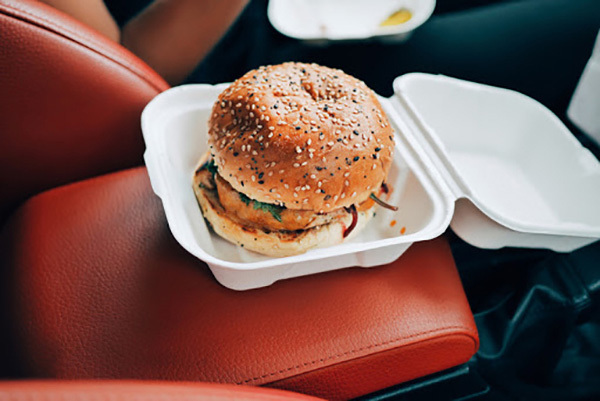 With so many new environmentally friendly and plant-based alternatives available, the senseless use of toxic and everlasting polystyrene will come to an end. Take the opportunity to recognize our excessive use of unnecessary styrofoam and plastic consumption. It’s ubiquitous and we are so used to it’s abundance, but we must change our ways and do what we can to cut waste. Attractive reusable water bottles and food containers are more durable, temperature accurate and attractive to use. Why not start your new year off with a renewed promise to be a more environmentally-conscious New Yorker. Let Royal Waste help you, your tenants and your employees learn best practices when it comes to reducing single-use items and New York recycling. Let’s keep our city clean, and improve our overall environmental footprint. 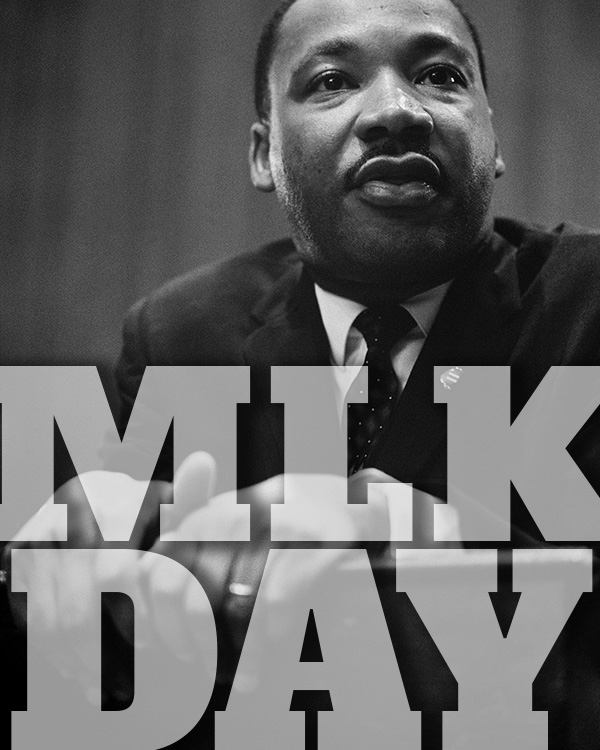 there will be no service Sunday Night, January 19th. Regular service will resume the evening of Monday, January 20th. Zero-waste solutions are now even more attainable for clients of Royal Waste and Emerald Brand. The goal of this newly announced partnership is to take the next steps in mainstreaming sustainability, making responsible choices simple, easy, and clear to the everyday consumer. This collaboration will utilize Emerald Brand’s compostable towels, tissues, packaging materials, and food service necessities at industrial composting facilities utilizing Royal Waste’s hauling services. The compost matter will then be moved to local organic farms where the breakdown process will begin and break down to soils. The new partnership provides clients of both companies with a transparent, full-circle composting solution. Connecting these two facets of the composting process curtails the amount of organic material ending up in landfills, maximizing environmental savings. The similar values and philosophies of these two individual organizations have aligned their missions to achieve their mutual goals of educating consumers on sustainable practices, while expanding attainable, quantifiable, and affordable sustainable solutions to the community. Team training will occur on both the Royal Waste and Emerald Brand sides of the program, ensuring accurate communication and execution of goals to new and existing clientele. For clients requesting full-circle composting services, Emerald Brand will be authorized as Royal Waste Services exclusive vendor for compostables. Similarly, for Emerald’s clients requesting full-circle composting services, Royal Waste Services will become Emerald’s exclusive partner for all organic and compostable waste in the New York City area. Royal Waste Service’s primary goal is to eliminate and reduce waste through education, training, and availability of sustainable options. For over 20 years, Royal’s commitment to a sustainable future is the beating heart of the company, and translates into everything they do. By better serving the community through sustainable strategies and waste reduction techniques, Royal’s dedicated team has worked with other businesses to improve operations, attain regulatory requirements, and improve diversion rates. As of August 15, 2018, more New York businesses are required by law to separate their organic waste. The New York City Department of Sanitation (DSNY) believes that this is critical to meeting the city’s zero waste goals and requires businesses full participation to help with organic waste recycling. The new rule went into effect August 15, 2018, and will be fully enforced beginning in February 2019. Any business not in compliance will be issued hefty fines by NYC DSNY. How Can Royal Waste Services Help? Royal Waste is dedicated to helping businesses comply with these rules as well as assisting you in creating a comprehensive waste management plan. We can take it a step further and assist you with setting up a full composting program to keep any commercial business in compliance with these new organic waste recycling laws. Our team is dedicated to changing the way people and organizations recycle because it’s more important than ever to minimize the excessive waste produced by the city and to decrease our overall carbon footprint. Let our team guide you through the new rules. It’s time for some trash talk! There’s a crisis in our country’s recycling process and it’s up to anyone who makes trash (in other words, everyone) to take some small steps towards big positive improvements. Unfortunately, in recent years, what’s been happening is more contaminated trash has made its way into recycle bins in the US, and therefore into the materials we export to China. This has caused China to refuse to accept our goods, thereby halting the entire process of recycling. We’re now drowning in garbage because more and more potentially recyclable materials are being rejected and therefore ending up in landfills. This is devastating to the recycling industry (and eventually our environment). We must do our best to create a movement towards clean recycling by every consumer, every person. It’s simply time to change our recycling habits. At the beginning of 2018, Beijing began what they call the “National Sword” program. They no longer accept import of 24 different kinds of solid waste, including most kinds of plastics. In addition, China is being extremely selective regarding the condition of cardboard and paper they’ll allow. All imported material has to have a contamination level of under 0.5%. To put that in context, a 1600-pound bale must have under 8 pounds of contaminants inside to be deemed okay to pass. Our goal here at Royal Waste is to make a real difference in the mission of recycling in NY. 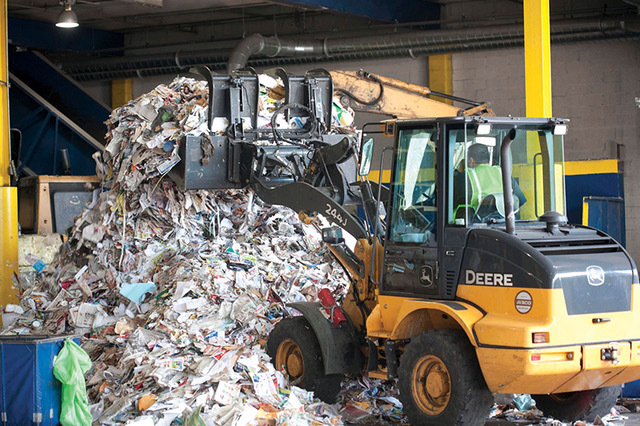 We’re leading the charge in the recycling industry and are proud to say that absolutely none of the thousands of tons of garbage we receive is being sent to landfills. Royal Waste is passionate about making recycling in New York — and the world — succeed. If everyone committed to small (doable) adjustments, the vicious cycle would start returning to a sustainable cycle. Royal Waste is a single stream recycling facility that offers 24/7 services and a dedicated staff to integrate seamlessly with a business’ existing waste management schedule, especially ensuring recycling compliance in New York City. Download our free signs to post, guide and remind everyone about the proper way to recycle. 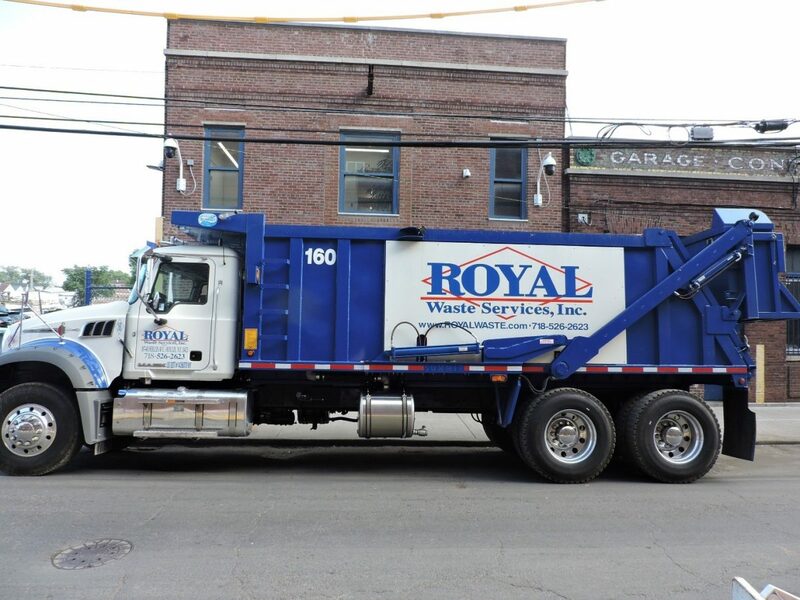 For more information, contact us today at info@royalwaste.com or 718-526-2623. The New York City Department of Sanitation (DSNY) recently announced new organic recycling rules that will affect larger restaurants, chain restaurants and grocery stores. They are expanding current commercial organic waste separation programs to include these establishments to continually improve upon current recycling standards. The goal is to implement best practices ensuring that less food waste is sent to landfills, and with organic waste recycling NYC businesses ensure they use or dispose of these materials more efficiently. Diverting this material from landfills to use for soil-enhancing compost or as an energy source in aerobic and anaerobic digesters is a key component of the City’s goal. This goal entails sending zero waste to landfills by the year 2030. 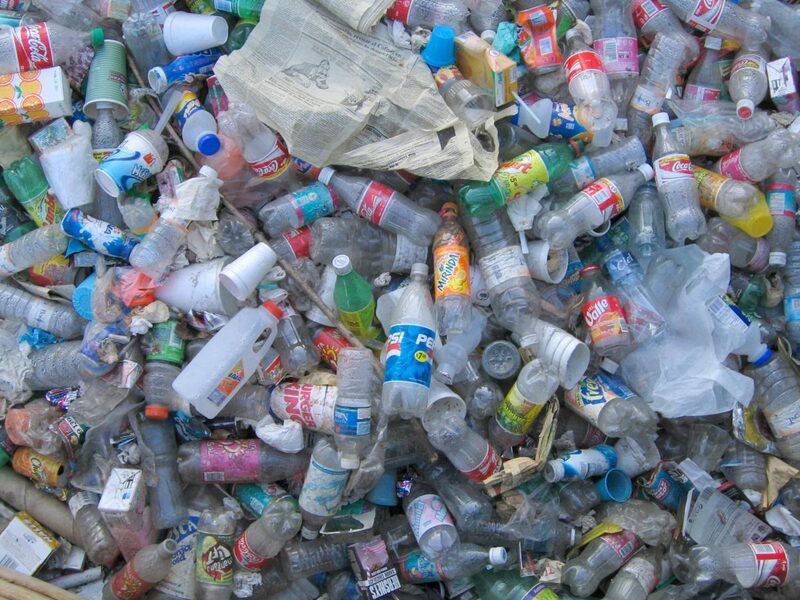 Right now, this waste makes up more than one-third of all commercial waste. Royal Waste strives to do everything we can to meet 100% of the new recycling standards to keep waste out of our landfills, but we cannot do this alone. We need everyone’s participation and help to make the system of recycling work. 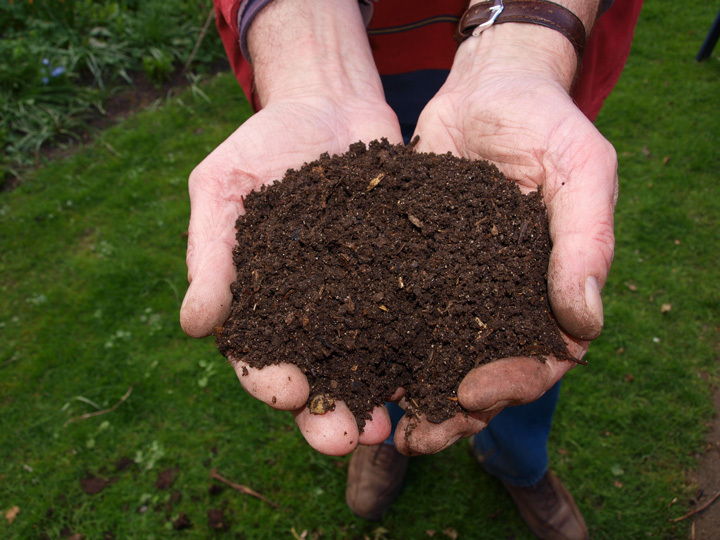 Our composting program can help you reduce waste at your place of business. Businesses who meet the minimum requirements below must comply with the business organics rules. Royal Waste Is Here to Assist You! Do you need assistance with complying with these new rules or need help with your overall waste management plan? Royal Waste will gladly guide you through the process. Our team of sustainability management experts is dedicated to helping our clients with their recycling and waste management needs. Contact us today to learn more. In 2013, the global recycling community was thrown for a loop when China launched Operation Green Fence, an initiative enforcing new regulations on recyclable waste from foreign exporters. In short, the new regulations stated that China would no longer accept recyclable material above 1% contamination, a significant decrease from the previous threshold of 8% contamination. 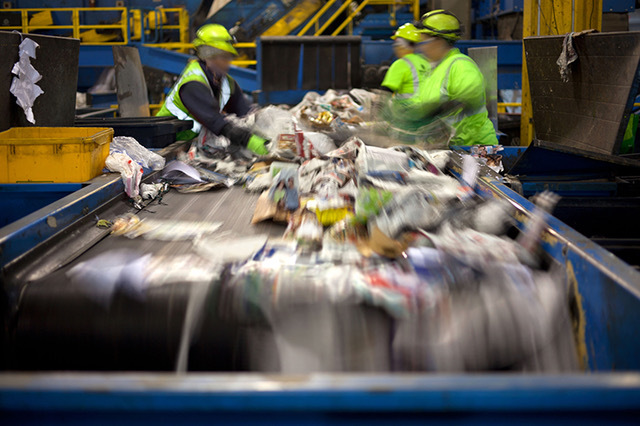 In effort to enforce their fortification of waste management and quality regulations concerning imported recyclables, China’s campaign wreaked havoc on American recycling plants. Today, almost five years since the initiative began, vast improvements have been made by Royal Waste and our constituents in an effort to properly manage exported recycling materials. What exactly has Operation Green Fence meant for the American recycler? Prior to the operation, each day, after thousands of shipping containers filled with Chinese exports from for American consumers were emptied, they were then reloaded with recyclable metals, plastics, rubbers, papers, cardboard, and textiles and sent back to China. There, these recyclables were used as raw materials by Chinese manufacturers. A decrease in quality of the American-exported recyclables began to negatively impact the system, with too high a percentage of the materials being contaminated by food, scrap, and garbage. With their manufacturers best interest in mind, the Chinese government set new parameters for imported recyclables which would avoid the massive cost of re-sorting the imported materials, protect their own producers as well as greatly reduce the environmental impact. 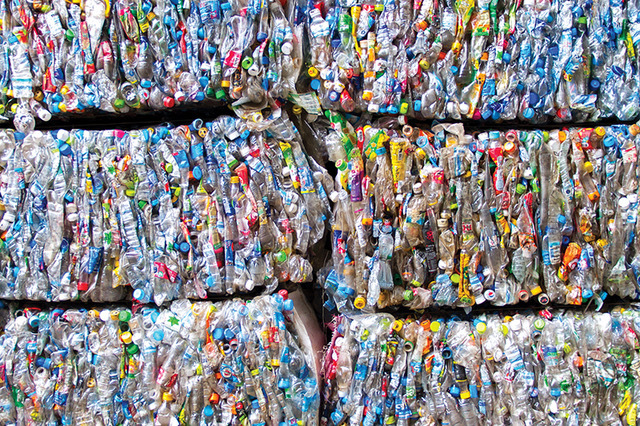 As one of America’s largest exports to China, recyclables are in ever-important commodity to the American economy, and it’s no wonder why China wanted to ensure their purity and cleanliness. After the enactment of the operation, 70% of the imported containers of recyclables were subject to inspection, prompting more attention from recyclers and shippers and all the way down to the consumer. Royal Waste Services is doing everything in our power to produce the cleanest possible product from what is turned over to us. Through consumer education, and our use of single stream recycling, quality control is at it’s highest level ever since Operation Green Fence was first introduced. Extra attention from consumers to properly sort and clean their recyclables in accordance with New York City sanitation laws is paramount and has helped us adjust our practices to align to Operation Green Fence. Prior to recycling anything, consumers should be sure that all liquids are emptied, and all food residue has been rinsed out from containers. With new laws recently enacted in the New York City area regarding recycling and waste services, it is more important than ever to familiarize yourself with these new regulations to help us ensure the materials are properly disposed of and recycled. Recycling is a team effort, and it starts with you, the consumer. Leave the messy stuff to Royal Waste Services. 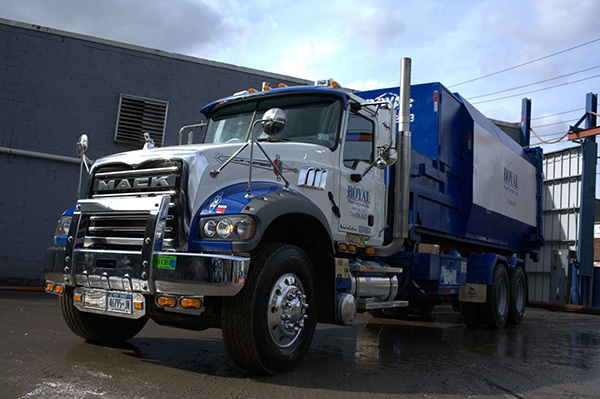 ABOUT ROYAL WASTE SERVICES, INC.
Royal Waste is a single stream recycling facility that offers 24/7 services and a dedicated staff to integrate seamlessly with a business’ existing waste management schedule, especially ensuring recycling compliance in New York City. Our goal is to eliminate waste by educating, training and providing our customers with more sustainable waste and recycling options and practices. For more information, contact us at info@royalwaste.com or 718-526-2623. 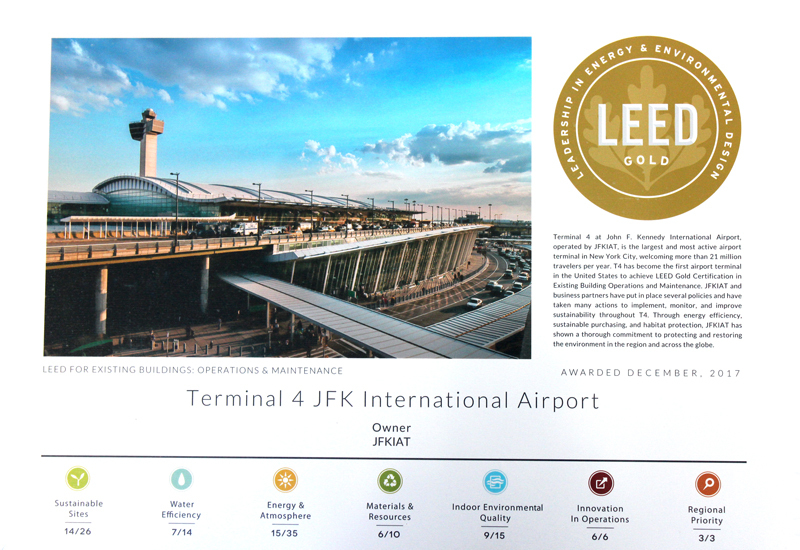 JFK IAT at Terminal 4 teamed up with Royal Waste Services, Inc., for help in achieving their Leadership in Energy and Environmental Design (LEED) goals. To that end, Royal Waste worked with the folks at JFKIAT to build a waste diversion program to improve their LEED scores. With Royal’s assistance, we helped bring the TTD waste diversion rate at JFK Terminal 4 from below 10% to now above 50%. 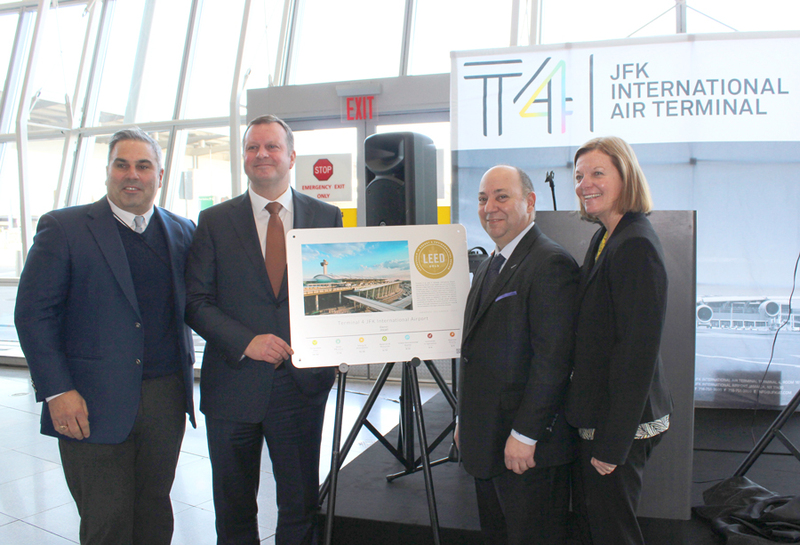 JFK International Airport now has the first air terminal in the U.S. to be awarded Leadership in Energy and Environmental Design (LEED) for Existing Buildings. It took two years of hard work to implement initiatives that now divert 6,226,640 million pounds of recyclables from trash yearly and save 50 tons of paper waste from bathroom towels. Royal Waste is committed to recycling innovation, sustainability progress and minimizing environmental impact. We support and empower businesses to make their own contributions to improving and minimizing their environmental impact and footprint. We know that far greater impact can be realized by partnering with businesses for this shared opportunity to pursue a better world. Learn how Royal Waste can help you achieve your LEED, waste diversion and waste management goals. Contact us today. (L-R) Micheal Reali, Royal Waste Services; Gert-Jan de Graaff, President and CEO JFKIAT; Joe Morra, Royal Waste Services; Sharon Murray, Facilities Manager JFKIAT. The company Etsy has always made recycling and composting an integral part of their company culture – even when they were small and long before New York made it mandatory to do so. In the past, Etsy required its employees to take organic waste to a local farm by bicycle. While some employees grumbled at the chore, others enjoyed it and its purpose. It, however, wasn’t a very efficient system. Where Does Organic Waste End Up? If you’d like to learn more about Royal Waste and how you can implement recycling practices at your business, please visit our website, or contact us for more information. Project Runway Films Sustainability Episode at Royal Waste Services, Inc.
For Season 16, Project Runway partnered with Royal Waste Services, Inc. to film an episode about sustainable fashion. 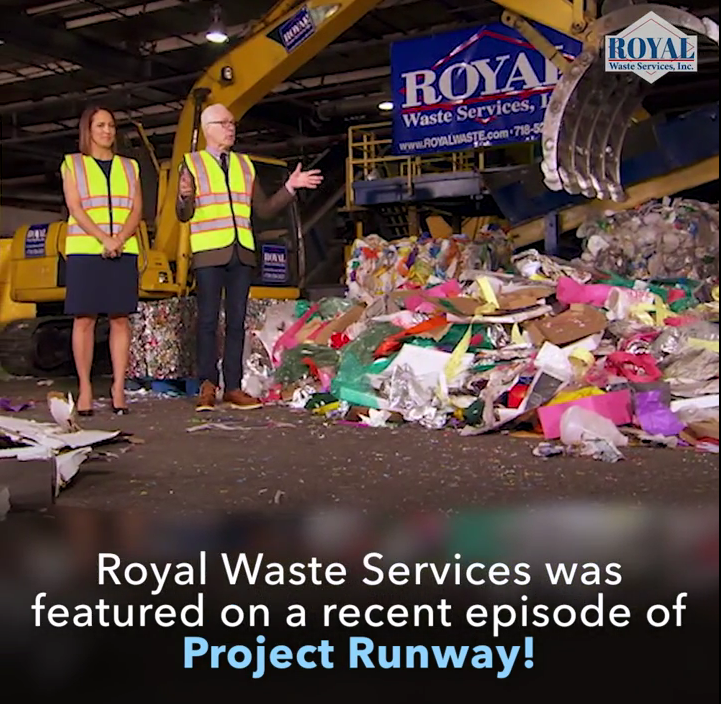 After visiting several top New York recycling companies and their respective facilities, Project Runway found that Royal Waste was the best partner to help spread the message of sustainability in the episode, An Unconventional Recycling. The Project Runway episode challenged designers to work with a team to create clothing from recycled materials found at Royal Waste. “The piles of recyclables that contestants sorted through on the show had been picked up from customers only a few hours before. Materials that our customers chose to recycle now lived on to become sustainable clothing,” said John. Royal Waste is a single stream recycling facility that offers 24/7 services and a dedicated staff to integrate seamlessly with a business’ existing recycling and waste management schedule. Our goal is to eliminate waste by educating, training and providing our customers with more sustainable waste and recycling options and practices. For more information, contact info@royalwaste.com or 718-526-2623. Employee Appreciation Day was a great success. 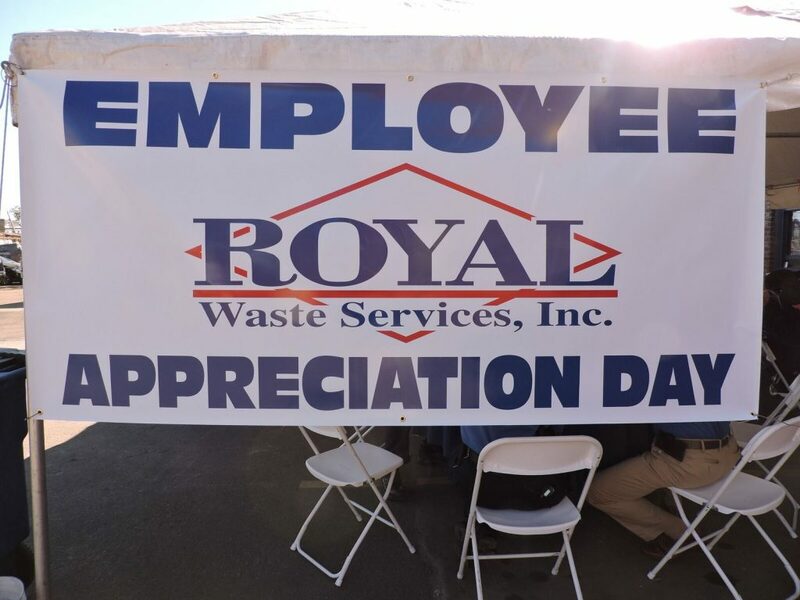 Royal Waste Services put on an all-day BBQ for each and every employee thanking them for their hard work and tireless dedication to the company. 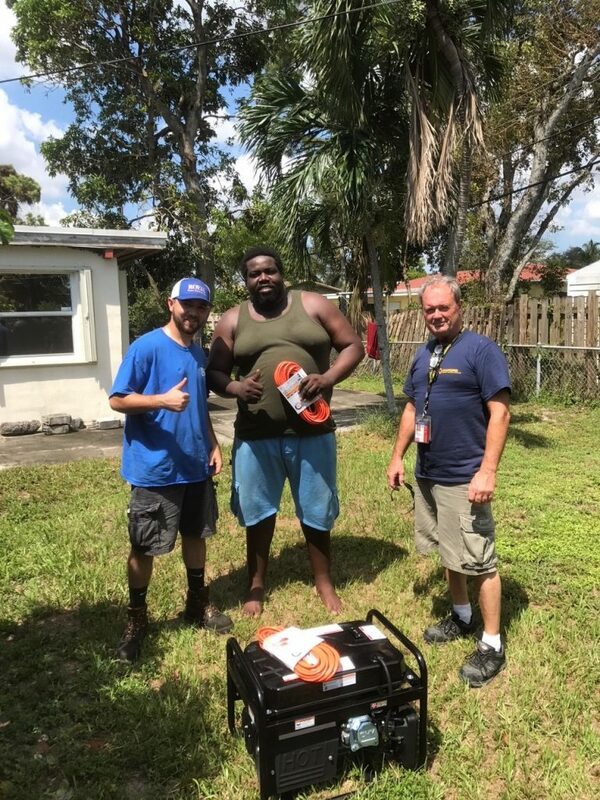 Operating in and around one of the world’s busiest cities is no easy feat so Royal wanted to make sure that their work is rewarded and appreciated! Everyone from office staff to drivers and mechanics to operators and laborers partook in the fun, and they took some necessary time off to unwind and enjoy delicious food with colleagues. Thank you for everything you do! Hurricanes Harvey, Irma and Maria devastated many areas throughout the United States and the Caribbean. As part of the cleanup efforts, JetBlue asked its vendors (which includes Royal Waste) if they would be willing to send personnel and resources as part of the relief fund. Royal Waste was happy to volunteer any assistance we could provide. 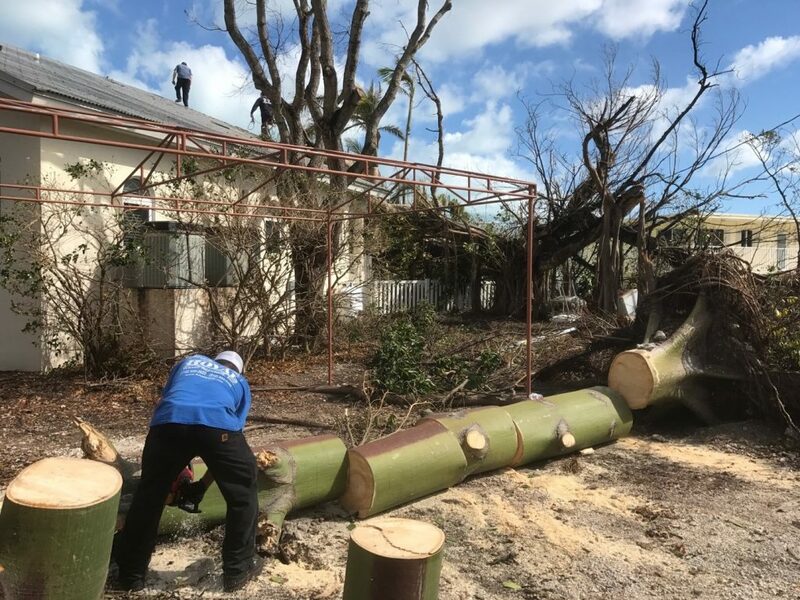 Joe Morra Jr., a manager at Royal Waste, spent nearly a week in the affected areas, assisting with cleaning up neighborhoods and helping get houses back to a livable environment. 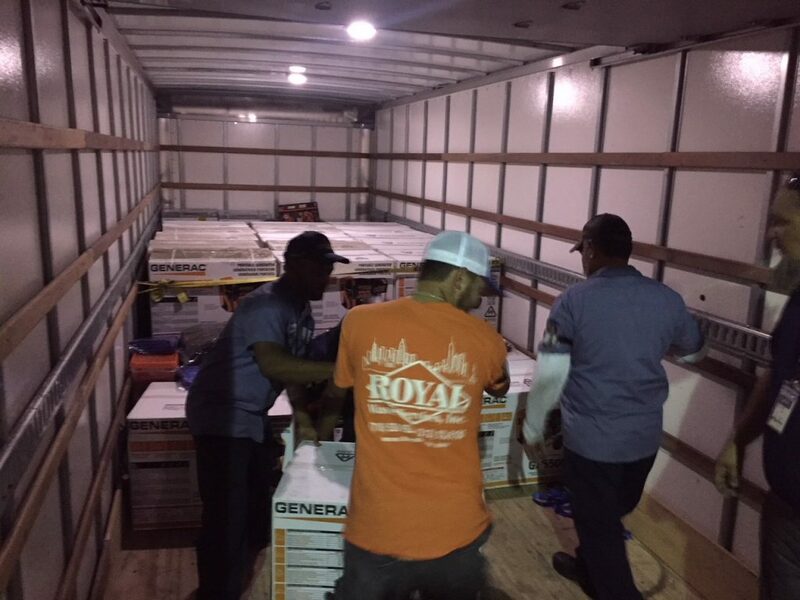 With millions of house stranded without power, the joint partnership between JetBlue and Royal delivered thousands of generates and brought light back to those in need. At Royal Waste, we are always willing to step up and help our neighbors – no matter where they are in the country. We were proud to support these families get back to some sense of normalcy after such a horrific disaster. We will continue to help any families that need assistance getting back on their feet. Royal Waste recently participated in two school book bag giveaways to help area children as they start the new school year. 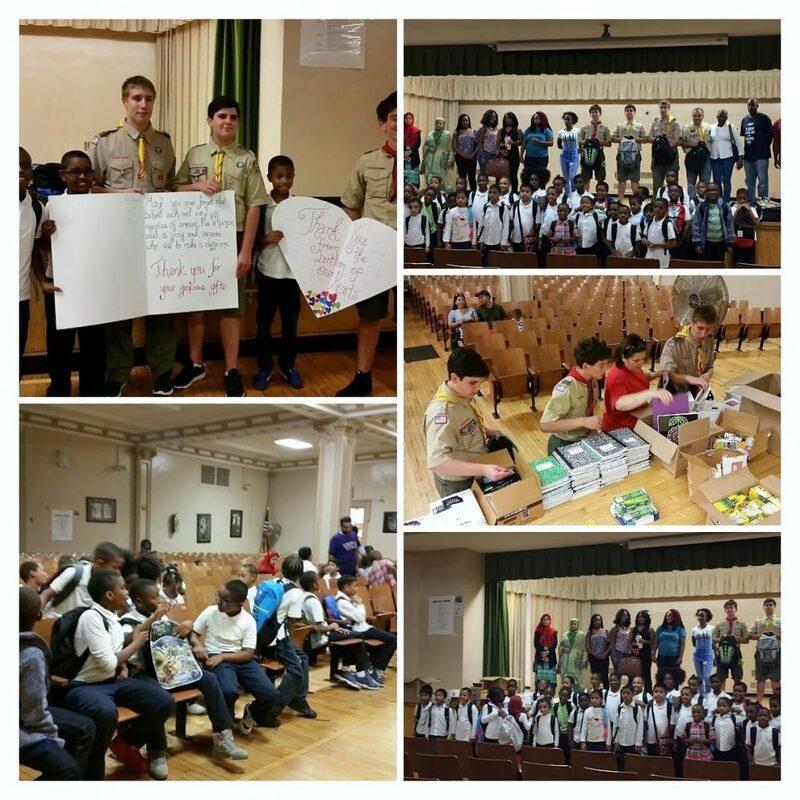 The first drive was held in coordination with the 103 rd Precinct community council and the Boy Scouts of America. 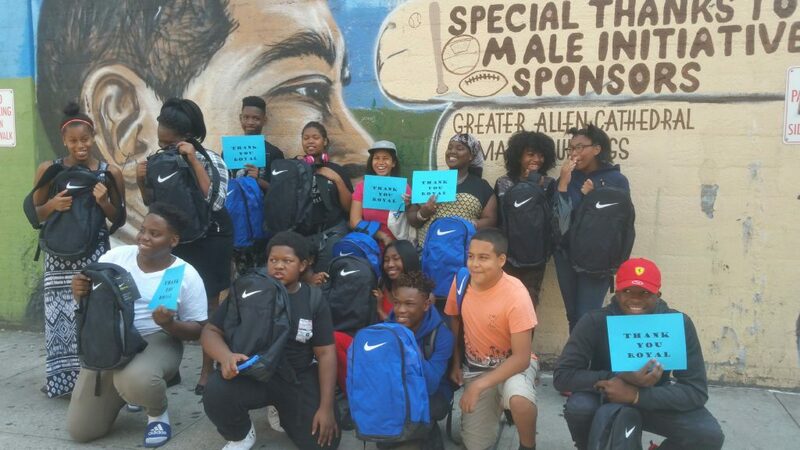 Royal provided over 100 book bags to kids from the ages of 9 to 16. Royal is always looking for meaningful ways to give back to our community. Royal is a community based, community minded company that is committed to serving all our neighbors especially our young children and the elderly. Read our mission to learn more about our dedication to the environment and our sustainable future. New BIC Requirement Goes into Effect August 1st: Are You Prepared? The New York City DSNY will be enforcing the new sanitation law across the five boroughs starting August 1st. The new law states that in addition to your regular waste removal services, each business must recycle all metal, glass, plastic, paper, and cardboard into a separate stream. All businesses that are not in compliance with this new law, post August 1st, will be issued a fine by the DSNY. If you need to set up recycling services please email: info@royalwaste.com. While this may seem simple, the new decal requires customers to add a few more details. To comply with the latest law and to avoid fines, customers must follow the below guidelines. 1. For refuse collection, indicate the day and time frame that your refuse will be placed outside. Write the approximate starting time when you will put your garbage on the curb, i.e. between 7:00 PM to 7:00 AM on Monday. 2. For single-stream recycling collection, indicate the day and time frame you will place your recyclables on the curb, again starting with the earliest time when you might possibly place them outside. 3. Your BIC Decal must be placed on the window of your store front or loading dock by no later than July 31st, 2017. Do not delay in getting this done. If your business uses a Royal Waste Services container for refuse and/or recycling, a representative from Royal Waste will place labeling both above and directly on the container based on the type of material designated to be used in that container. If you need more information about this new requirement, or simply want to ensure that you are following the correct procedures, Royal Waste is here to walk you through the process. We have a team of highly trained sustainability management experts. Royal Waste Services is an official, licensed, single stream recycling hauler serving the greater New York City, tri-state area. Our goal is to achieve zero waste, so subsequently all of our services can be deployed or developed to meet any standard or customized waste management objectives for removal, recycling, or reduction. Contact us today! 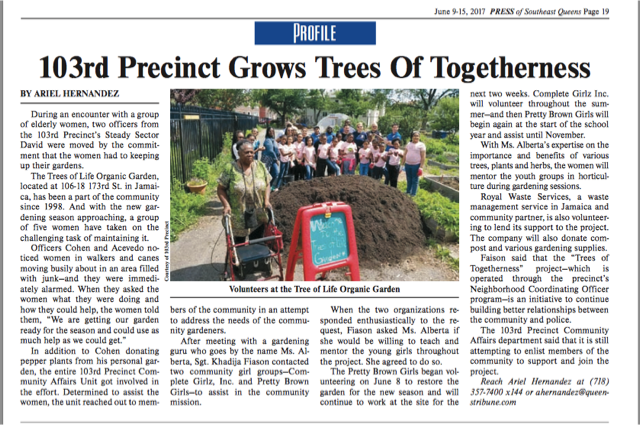 Royal Waste Services, Inc. again demonstrates their commitment to the environment and to the New York area by supporting a community garden with the assistance of compost, gardening supplies and volunteers. As mentioned in The New York Times, The Compost King of New York, Michael Reali, Royal Waste’s Vice President, voiced both his stance and commitment in diverting food waste from landfills. Whereas other companies struggled in their composting efforts due to high contamination rates, the team at Royal Waste Recycling seemed to quickly grasp this ambitious responsibility with ease. Organic composting in NYC has a Champion! As a full day past of Royal’s composting trucks entered its material recovery facility, there stood a 20-foot mound of collected organic waste from fruit wholesalers. After the crew removed any extraneous material, the decontaminated pile was loaded and ready to be transported to McEnroe Organic Farm in upstate New York. Here the decontaminated organic waste goes through an arduous process, but ultimately gets to live a second life either to nourish and sustain the farm or as topsoil to be sold to the local community. Through the effort of Michael Reali and his team at Royal Waste Services, organic food waste now can be seen as a resource, therefore closing the loop of sustainability and recycling. JAMAICA, QUEENS – As Royal Waste Services continues to strive to make head waves in today’s new environmental and local recycling laws, we are pleased to announce the visit of Broadway Green Alliance to our Recycling facility. We have been servicing various theatres in the heart of New York City for the past several years. Helping them to become greener by implementing a straightforward and efficient recycling program, that not only complies with the New York City Zero Waste recycling laws, but allows the Broadway Green Alliance to be a step ahead in helping our environment. We are grateful and give our congratulations to Broadway Green Alliance for all of their accomplishments for the past several years promoting and making a difference by implementing recycling avenues in the heart of New York City Broadway Theaters. Learn more about our waste management and organic recycling services now. Contact us today. Royal Waste Services foundation is built on our values, which distinguish us and guide our performances through quality service with Integrity. We conduct our business in a socially responsible and ethical manner. We are committed to protecting the environment, health, safety of our employees, customers and the communities where we operate daily. These values have lead to this outstanding award presented by the Queens Courier. Congratulations to the dedicated employees of Royal Waste Services as this wouldn't have been possible without them! Jamaica, Queens – Another successful year at the Royal Waste Services Annual Thanksgiving turkey drive! Royal distributed over 500 turkeys throughout the local community, churches, and even to our own employees. We have been so blessed to serve the people of Jamaica for over 20 years and are lucky to call it our home. NORTH BABYLON – Sixth-graders from Robert Moses Middle School are working hard to keep their school green. Last year alone, the student kept 2 tons of recyclables out of landfills. Motivation, infrastructure and economics are key to implementation of office composting at The Durst Organization, one of New York City’s largest family-owned real estate developers. The program is the brainchild of Helena Durst, a co-vice president and fourth-generation family member, who is leading the charge to green the company’s building management practices. 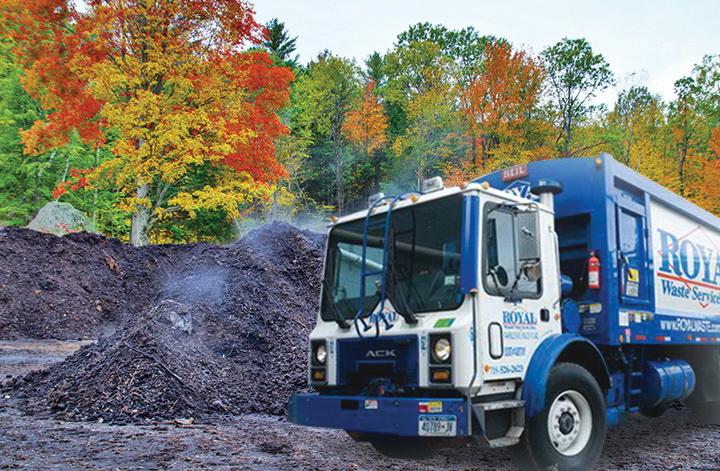 Partnering with Durst is Royal Waste Services Inc., in Hollis, New York, a waste management and recycling company that collects, processes and transports the separated organics, and McEnroe Organic Farm, near Millerton, New York, where the material is composted. Durst hopes to ultimately expand its waste diversion program beyond just the company’s headquarters at the Bank of America Tower in Manhattan to tenants in the company’s sizable commercial real estate portfolio. Learn more about our waste diversion and organic recycling services by contacting us today.